A few weeks ago we let you know about some summer camping “hacks” to help you get ready for the upcoming fishing season. This week I thought I’d continue the camping line of thought with a review on one of the lightest, most compressible sleeping bags I’ve ever come across. The Sea to Summit Spark series of sleeping bags have to been seen and felt to be believed. They are insanely light, small and weigh next to nothing. I recently took what Sea to Summit calls the Spark SpI on a photography assignment to the coast of Texas. The shoot consisted of the crew driving Yamaha OHVs with kayaks on top. We were exploring the vast, remote beaches of East and West Matagorda bay for redfish and trout. Needless to say, space was at a premium with all the fishing, camping gear, and photo equipment. I needed the most minimal tent and bag possible. The Spark SpI performed flawlessly and was very comfortable, with lows in the mid-50s at night. The Spark SpI is the smallest and lightest of the Spark series and is rated to 46 degrees F as a lower limit with 23 degrees F being the most extreme temperature you’d want to rely on it for. The comfort zone for this particular bag is the lower 50s. 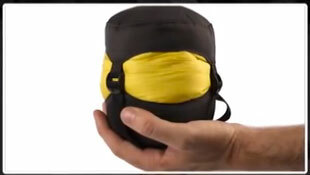 When packed in the included compression sack the sleeping bag literally fit in the palm of my hand. In total the bag (in regular size) weighs an astonishing 12.3 oz. That’s it! Sea to Summit didn’t skip on down quality either, utilizing their ULTRA-DRY 850+ loft goose down. This has been treated with a “nano-level water repellent polymer that vastly improves the down’s reaction to water without effecting its weight or loft performance.” Sea to Summit claims that this down actually retains over 60% more loft and absorbs 30% less moisture when compared to untreated down. Which is perfect for anglers that are always around water. The only drawback I found with the bag was the 1/3 length zipper which doesn’t let you stick a leg out if you overheat. I’m guessing this was done to save on weight though and is hardly a complaint if you’re using the bag at the proper temps. At $299 the bag, while not cheap, isn’t very expensive either when compared to others in it’s class. It comes with a compression sack, mesh storage bag, and a wash bag with instructions printed right on it. If you’re the type of person who appreciates expertly crafted minimalist gear, I would suggest the Spark Line of bags any day. Be it for a back-country cutthroat trip or rafting expedition, or even to keep in your car as part of your first aid emergency kit, this bag is perfect.